God, I love Samosas!!! I have grown up in India gorging on these delectable savory pastries at every opportunity - on family outings, at roadside vendor stalls, in parties ... in short, everywhere! 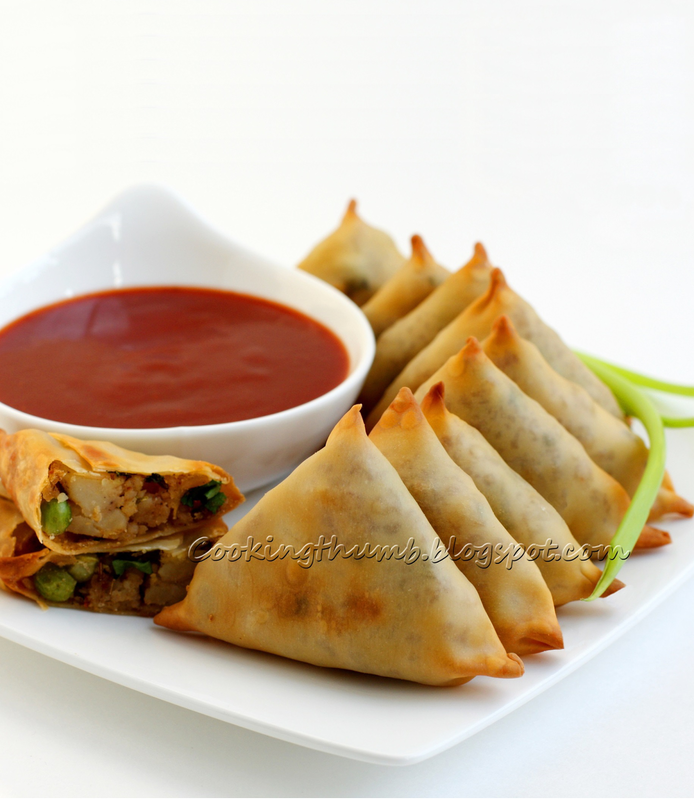 For those who do not know, Samosa is a deep-fried pastry stuffed with spicy potatoes & green peas - it is a hugely popular snack in India & other Asian countries, with multiple variants created by replacing the stuffing with other veggies or with minced meat. It is usually served with Tamarind Chutney, Cilantro-Mint Chutney or with Tomato Ketchup. Sadly however, the major downside to the yummilicious Samosa is the health aspect - it is deep-fried that makes it high in calorie count :( It also does not help that the traditional samosa requires a lot of time & effort to prepare from scratch & is quite hard to get it just right, so much that it is much simpler to get them from a restaurant as opposed to making them at home. Once the boiled potatoes have cooled down, mash the potatoes coarsely using your hands. Keep aside. Heat oil in a non-stick pan on medium heat. Add cumin seeds & saute till the cumin seeds begin to change color. Add ginger & green chillies. Saute for a minute. Add green peas & saute for a minute. Add potatoes, dry mango powder/lemon juice, cayenne pepper, coriander powder, garam masala & salt. Toss well such that the potatoes get coated with the spices thoroughly. Saute for a minute. Add chopped cilantro, toss again. Remove from heat & allow it to cool. Preheat oven to 350 degrees F. Line the baking sheet with parchment paper. Keep aside. In a small bowl, add 1/4 cup of water. Keep aside. 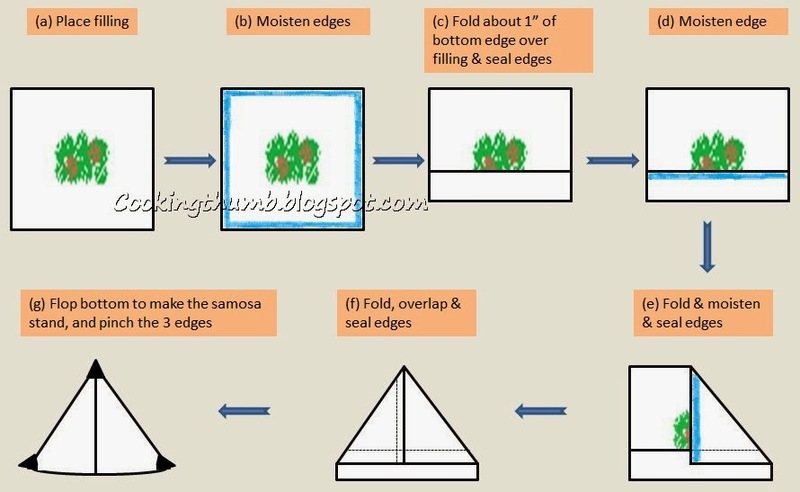 Take a wonton wrapper (keep the remaining wrappers covered with a damp cloth else they will become dry & brittle). Dip your finger tip in the bowl of water & moisten all the edges of the wonton wrapper. Place about 1 1/2 tbsp of potato filling in the center of the wrapper. a) To follow Simple method (Chart I) - Fold the wrapper in half to form a triangle & press the edges together to seal (see step c in Chart I). b) To get a shape as shown in my above picture - Follow steps c-g in Chart II. Brush the entire filled wrapper lightly with olive oil. Arrange on baking sheet. Repeat the process with remaining wrappers. Bake in oven for 15 to 20 minutes or until golden and crisp, turning the filled wrappers halfway through baking. Remove from oven & transfer to a serving platter. Serve hot with Cilantro-Mint Chutney, Tamarind Chutney or tomato ketchup. All of these spices are available in Indian Grocery Stores, & it is best to buy them from an Indian Grocery store to get authentic flavors. These spices are also very common & may be available in your local supermarket (I have seen them in Safeway - a popular supermarket in California). Lovely samosa and baked too ! Wow ! Wow! These look delightful! I am going to try them! once made, but before cooking, Ithink they would freeze well. can I premake these and bake them at a later date?